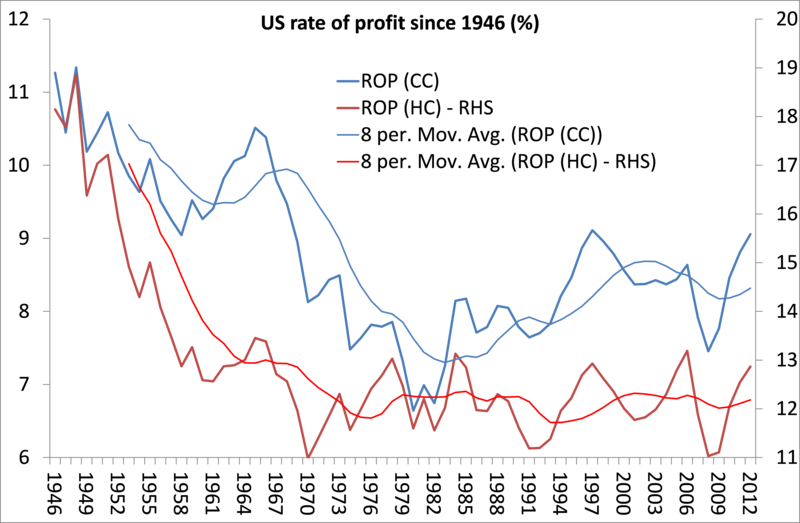 « US rate of profit – up slightly in 2012, flat in 2013, down in 2014? In my last post (https://thenextrecession.wordpress.com/2013/12/16/us-rate-of-profit-up-slightly-in-2012-flat-in-2013-down-in-2014/), I updated my calculations on the US rate of profit since 1945 with the latest data on profits and fixed assets provided by the US Bureau of Economic Analysis. Based on my measure of profits and assets, which I reckon is the closest to what Marx considered his rate of profit (with all the caveats and provisos that I and others have discussed at length – see my paper, The profit cycle and economic recession, I found this. 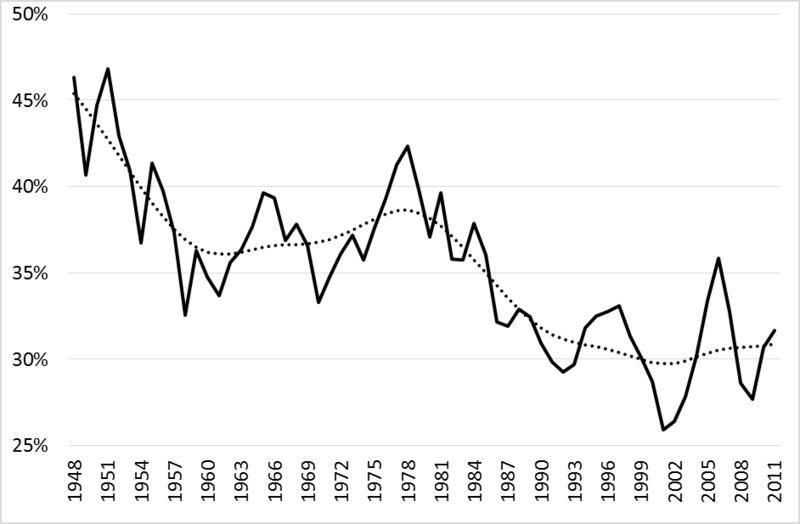 My main conclusions were that: 1) there was a secular decline in the US rate of profit from 1946 to 2012; 2) but it was not in a straight line, because from about the early 1980s, the rate of profit recovered up until about 1997. The recovery did not restore the previous high level of the rate of profit seen in the 1960s; 3) from 1997 to now the rate of profit has been flat or fallen slightly, with a rise from the recession of 2001 to a peak in 2006 and then a fall during the Great Recession of 2008-9 and then a recovery to now, with the 2013 rate of profit broadly in line with the 2006 peak or a little lower. In addition, I concluded that falling or flat profitability from 1997 was the underlying reason for the eventual mild slump in investment, employment and production in 2001 and that only a credit-fuelled boom in property and stocks revived profitability until 2006 before a new fall drove the US and eventually the world economy into the Great Recession like a road runner over a cliff. Also the secular decline in US profitability, mainly achieved between the mid-1960s and the early 1980s, is best explained by Marx’s law, namely by a rising organic composition of capital outstripping the effect of counteracting factors like a rising rate of exploitation of labour. From the 1980s to the late 1990s, the counteracting factors dominated in the so-called neoliberal era. But after 1997, Marx’s law began to operate again, as a significant rise in the organic composition of capital was not sufficiently counteracted by a large rise in the rate of exploitation (partly revealed in inequality of incomes reaching extremes not seen since the 1920s). Nevertheless, scepticism remains about both my calculations of the US rate of profit and my interpretation. So to help us with the debate, I would like to bring to your attention the recent work of two brilliant young Marxist scholars, based over ten thousands miles apart. The first is Peter Jones, a PhD student in Australia. In a paper prepared for the 12th Australian Society of Heterodox Economists Conference (Jones, The Falling Rate of Profit Explains Falling US Growth v2), Jones starts by showing the contrasting results that you can get, depending on how you measure the rate of profit and also what rate of profit you reckon is important for understanding the laws of motion of capitalism. Some reckon that the rate of profit that matters is the after-tax rate of profit based on current cost measures of fixed assets, as this is (it is argued) is what matters for corporations’ investment decisions. This is what Jones calls the narrowest measure. It looks like this. We can see that, on this measure, there was a significant recovery in the US rate of profit from the mid-1980s (using the dotted HP trend line). This recovery did not cease in the late 1990s despite two sharp falls in 2001 and in the Great Recession, although the trend rate remains below the peak achieved in the mid-1960s. However, Jones contrasts that measure of the rate of profit with what he calls the broadest measure of profit – of corporate gross value-added less depreciation and employee compensation and before interest or tax is deducted, against fixed assets measured in historic costs. This measure is pretty similar to that used by Andrew Kliman in his book, The failure of capitalist production (see my post https://thenextrecession.wordpress.com/2011/12/08/andrew-kliman-and-the-failure-of-capitalist-production/). This measure looks like this. 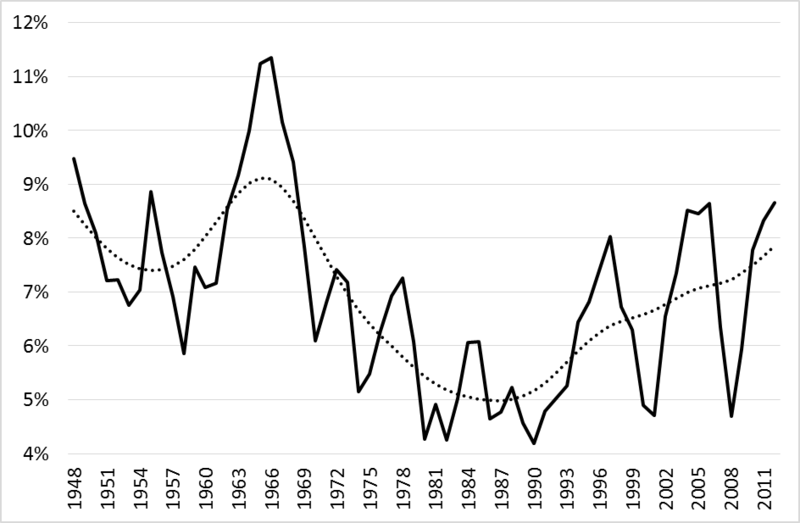 On this measure, the rate of profit makes no recovery on a trend basis (dotted line) in the 1980s, although it appears to flatten out in the last decade and was even rising slightly going into the Great Recession. So where does that leave us? Well, we are helped out of our dilemma by the recent work of Themis Kalogerakos, based in the University of Lund, Sweden, just about as far away from Australia as you can get. TK is doing a master’s degree there and his thesis (EKHR61_Themistoklis_Kalogerakos) analyses all the various rates of profit from broad to narrow, as Deepankar and Vasudevan did last year (deepankar_basu_ramaa_vasudevan_technology_distribution_and_the_rate_of_profit_in_the_us_countdown). TK finds that the US rate of profit, however it is measured, appears to have two main periods: one where a high rate falls from the 1960s to the 1980s; and one where it recovers from the 1980s. Nothing new there. But TK also identifies within those two periods, two sub periods. The first is the high and slightly rising rate of profit from 1946 to 1965, then the decline from 1965 to the early 1980s, then the rebound up to 1997 and then, finally, a period of decline from 1997. This matches exactly my own interpretation of the data, starting back in 2006 (see my book, The Great Recession). What is helpful about TK’s paper is that he shows that, however you measure the rate of profit, whether by the broadest or the narrowest measure or in between, the US rate of profit exhibits the four phases described above. The average rate of profit for the whole period 1946-2011 (TK has not updated for 2012) was 17.99% for the broadest measure and 6.03% for the narrowest. Between 1946-65, the rate of profit was 11% above this average of the broadest measure and 15% above for the narrowest. In the neoliberal period from 1982 to 1997, the rate was still 9% below the average (broadest) or 18% below (narrowest). And the average for 1997 to 2011 was still below the overall average by 5% (broadest). It was 5% higher than the average for narrowest measure from 1997-2011. But in this latest period, the rate in both cases was still below the 1946-65 golden age period by 10% and 15% respectively. These measures were based on current costs fixed assets. If historic costs are used, then TK’s results are no different. On the broadest measure, the closest to Marx’s, the average rate of profit from 1997 to 2011 was 23% lower, while on the narrowest measure it was 16% lower. So my conclusion that there has been a secular decline in the US rate of profit is clearly confirmed by TK’s calculations. What these results also reveal is that a key counteracting factor in reviving corporate profitability after the 1980s in the US has been the significant reductions in corporate tax and interest costs. This is expressed in the narrow after-tax profit measure in the 1997-11 period exceeding slightly its overall average since 1946, although it was still below the period of 1946-65. But more important, TK looks not just at the level of profitability but also at the annual change in the US profit rate. Across the whole period from 1946, whatever the measure of the rate of profit and whether measured from trough to trough in the cycle or from peak to peak, the US rate of profit has fallen, by about 0.6% a year. And even more useful for deciding whether profitability can be seen as the underlying driving cause of the Great Recession, in the period of 1997 to 2011, the rate profit fell annually by 0.6% (broadest) and 0.3% (narrowest). This confirms the analysis that G Carchedi and I made in our recent paper, The Long Roots of the Present Crisis (The long roots of the present crisis). And TK’s last sentence brings me back to the paper by Peter Jones. In his paper, Jones wants to isolate that part of the official profit figures provided by the BEA National Income and Production Accounts (NIPA) that are really ‘fictitious’ so that we can get to the ‘deeper’ rate of profit that more closely matches Marx’s value measure. Then we can judge better the validity of Marx’s law of profitability and whether it provides the best indicator of likely economic growth and accumulation in the US economy. I tried to do something similar in my paper, Debt matters ((Debt matters) by measuring profits against corporate net worth. But I think Jones’ approach has greater merit over mine, or over the recent attempt by Alan Freeman to adjust for fictitious capital. Jones recognises that a large part of fictitious profits is already excluded in the NIPA because they do not include capital gains. But in his view (correctly I think), the official figures for profit need to be adjusted for other fictitious profits, namely those made by banks from lending to government (bond purchases) and from utilising the savings of workers (mortgages etc). Government spending that is financed by borrowing is recorded as output in NIPA. But it is really fictitious income. Jones goes through the NIPA accounts to deduct what he reckons are the components of this fictitious profit to come up with a measure of profit that best represents surplus value created in production and realised y the corporate sector. When he puts this against net fixed assets, the result looks like this. 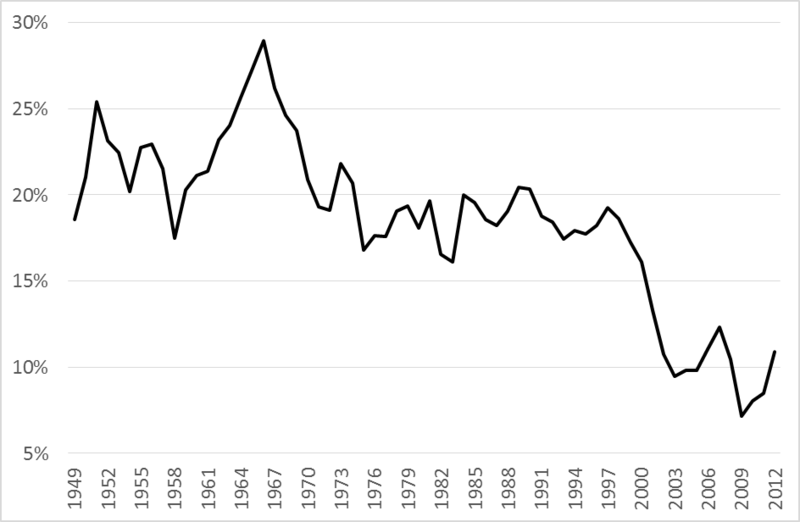 Now the US rate of profit based on this non-fictitious profit clearly shows a secular decline over the whole period and the same sharp fall after 1965. It also shows a stabilisation and slight rise after 1982 before falling sharply after 1997. Thus the US rate of profit leading up to the Great Recession had taken a significant tumble, suggesting again its role in that slump. If Jones is right, it also reveals that the rise in the rate of profit recorded from 2002 onwards in both his broadest and narrowest NIPA measures (as above) is down to fictitious profits that evaporated in the Great Recession. Jones goes on to show that, on this ‘non-fictitious’ measure, the rate of profit is closely correlated with the growth of corporate output, thus confirming “the explanatory power of Marx’s law “. Back in Sweden, TK also looked at that explanatory power in his paper. As others before him (including me), he examined the relationship between the movement in the US rate of profit and the organic composition of capital. He found a negative correlation of 0.66 between the two on the broadest measure of profitability. And he found a similar positive correlation between the rate of accumulation and corporate output growth, as Jones does. And TK also found that that there appears to be a cycle of accumulation of capital and profitability from trough to trough of about 33 years, nearly the same as I found in my 2006 calculations (see my book, The Great Recession). But the accumulation rate has been falling secularly trough to trough and peak to peak, so the movement in the organic composition cannot be the only factor. But that’s another story and as it’s my birthday, I’m out of here! This entry was posted on December 19, 2013 at 1:30 pm and is filed under capitalism, economics, marxism, Profitability. You can follow any responses to this entry through the RSS 2.0 feed. You can leave a response, or trackback from your own site. Happy Birthday, Mr Roberts. You’ve had a very productive year! And thanks for the nice birthday present for us all! Happy birthday – and thanks for all the fantastic articles this year. When you’ve recovered from celebrating, I wonder if you could comment on whether the rate of decline/rise in a given cycle has any direct influence on the trigger points for recessions and recoveries? E.g. an ARP in the final figure of roughly 20% appears compatible with both peaks and troughs in the economic cycle through the 80s and 90s. Happy birthday, Michael–and, while I’m at it, best wishes for the Holidays and for a very productive 2014! Happy birthday, Michael, and thank you. I realise there is not the same confidence in stats from before WWII, but I’d be interested to know what you and others guestimate the profit figures to be, especially given the idea that “there appears to be a cycle of accumulation of capital and profitability from trough to trough of about 33 years”. Starting post-war means we have had only two of these cycles, which doesn’t seem enough to draw firm conclusions. How do we know which one of the two represents the trend? I guess the profit rate wasn’t too healthy during the 1930s, so it might be that if you extend the period under discussion, the part up to the mid-70s is the exception. David, sorry for slow reply. Yes, starting post-war and just in the US does not provide enough support to draw firm conclusions about profit cycles. And it remains a tentative hypothesis for me although I have tried in my book, The Great Recession, and in other papers to justify it with some theoretical analysis and further empirical data. That includes looking at the period before WW2 and in various countries. Several studies, including some by me, suggest that cycles can be identified going right back to the late 18th century and early 19th century and Marx and Engels discussed this phenomena as well during the mid-19th century. The fact that there are recurrent crises suggests cycles of profitability, but many deny that there is anything ‘regular’ to read into the data. It’s an issue I continue to deal with and will be prepared to be proven wrong. Happy birthday! Have enjoyed your blogs (two years’ worth) especially the one on Slovenia. Apologies for a language ambivalence in a reply once. I mentioned a flimsy connection but failed to mention it was mine due to a determined toddler wrestling a laptop from his mother. Now, toddler-free, I can say happily that any mention of phD and masters students tackling this problem/puzzle is already a thumbs up from me but also that they are 10,000 miles apart! But in all seriousness, thanx for helping out a not very confident economics student. I only got a B for an economics A’ level that was nearly 25 years ago. The problem with categorising the different measures as narrow or broad is that it doesn’t actually tell us anything about the inherent merit or otherwise of the categories. The reason for using current rather than historic valuations of the fixed capital stock is straightforward. Capitalists have to pay for the next set of machines when the current set is worn out/obsolete. They have to depreciate capital at current rates to ensure that the cycle of capital accumulation can continue. Its got nothing to do with narrow or broad. Historic prices over estimate value added, underestimate depreciation and over estimate the rate of profit. Similarly taxes paid to the government are not surplus value that can be accumulated, and so should not be included in measures of surplus value. Use a broad measure if you will, provided that you can explain why it is a better measure given the above points – if you can’t then its more accurate to describe it as a wrong measure. Finally on the further adjustment for “fictitious profits” this is all wrong. Profits are not ficititious – capital is. Windfall profits are excluded from the NIPA as they are not created in production. Kuznets was after all a good old Plekhanovite Menshevik who understood Das Kapital rather well. The only part of fictitious capital that is real are the interest payments paid on it. To exclude them completely distorts the picture. As can be seen by the last graph which would have us believe that the mild recession after the hi-tech bubble was a deeper crisis for US capital than the system crisis in the early 1980s. First of all, Happy Birthday Mickey. Its notable that capitalists in measuring whether stock markets are frothy or not, use as one of their measures Tobin’s Q. It is a measure of the valuation of companies based on their share price compared to the current cost of replacing all of the capital of those companies. It is the replacement cost not the historic cost they measure. Bill is correct that this is what Capital – if not necessarily individual capitalists – is concerned with in measuring the rate of profit. It is precisely the point that Marx makes in Volume II in analysing the circulation of Capital. As he says, the Rate of Profit can only meaningfully be measured as a measurement of the increase in the actual physical capital, so either the circuit P..P, or else C’ – C’. But, in order to measure that increase, its necessary to use money prices for these quantities, i.e. as he puts it money as unit of account. So, its not just the value of the fixed capital replacement that Marx is concerned with here, but also the circulating capital both constant and variable. In fact, Marx sets out both in Volume II, and Volume III, how it is that changes in the prices of this circulating capital – separate from changes in its value – arising from sudden increases or falls in demand, cause capitalist crises. Assuming constant money prices, however, Marx demonstrates in Volume II, that a quantity of commodities (labour-power and means of production) enter the production process. The capital value of this productive-capital is transferred to the resulting commodity-capital. The capital value in both cases is represented by a money equivalent M, which is only a measurement of this capital-value in money as unit of account. But, because it is capital-value that moves through this process, that value is subject to constant change, because its components – the labour-power and the means of production – as commodities, are themselves being constantly revalued, along with all other equivalent commodities. The M that results from the circulation process, from the sale of C’, is then only a money equivalent of the capital value C that entered the circuit of production as labour-power and means of production. M, therefore, buys the same quantity of C, as entered into the circuit – provided market prices do not change between the realisation of M, and its being used to purchase C.
As M’ is split into this M, which reproduces the original amounts of labour-power and means of production (productive-capital) consumed in the production process, its other element m, is used for either unproductive consumption, or for accumulation. If it is used for accumulation then what has happened to the value of C is of utmost importance as Marx sets out. Whilst M rises or falls with the change in Value of C, m is a new value. If the value of C has risen, then m will buy a smaller quantity of it than it would previously have done. Accumulation will be slowed, and vice versa. However, as Marx sets out repeatedly in Part 2 of Theories of Surplus Value, In Volume II of Capital, and in Chapter 6 of Volume III, the market prices of commodities can rise or fall massively even when their values do not change. The market price of inputs can rise because demand for them rises sharply – for example the introduction of a new cotton spinning machine, or because there is a problem with their supply – US Civil War. Secondly, the ability to realise the values of the inputs depends, Marx says on the ability to sell all of the commodities produced. Say’s Law assumes that demand will always be able to absorb Supply, because on a Value basis, it appears that Supply creates Demand. So, there can never be any overproduction. Some Marxists keen to avoid a mistaken label of under-consumptionism also adopt effectively this position, so that the explanation for crises must be looked for elsewhere from the repeated analysis of Marx and Engels that crises of overproduction are caused by the fact that whilst Supply is driven by Value (and can expand only limited by the technical constraints of the age), demand is driven by Use Value, and grows much more slowly according to quite different laws, determined by elasticity of demand. So, as Marx says, just because I can buy 6 knives for the price I previously paid for 1, because the development of productivity has reduced the value of knives, does not mean I will do so. If the price of cars is today only a quarter of what it was in 1960, that is no reason I will buy 4 cars rather than the one I actually need to meet my requirements. So, market prices always tend to fall below market values/prices of production. Capital is increasingly unable, therefore to realise the surplus value produced in commodities, unless it can find ways of getting consumers to buy ever more commodities, and can find ever new commodities to produce. It is that ability to find ever new commodities to produce, ever new arenas in which productive capital can be employed that goes in cycles, according to the duration of the Long Wave. It is that which determines whether the economy is going through a period of boom or stagnation, and it is also what determines whether it is a period when the rate of profit tends to be rising or falling. What we see in all those examples is wave-like pattern! Second it would be wise to distinguish between the real sector and the financial sector, as i.e. Alan Freeman did in his article The profit rate in the presence of financial markets: A necessary correction, for the UK and the US. “Some Marxists keen to avoid a mistaken label of under-consumptionism also adopt effectively this position, so that the explanation for crises must be looked for elsewhere from the repeated analysis of Marx and Engels that crises of overproduction are caused by the fact that whilst Supply is driven by Value (and can expand only limited by the technical constraints of the age), demand is driven by Use Value, and grows much more slowly according to quite different laws, determined by elasticity of demand. Interesting argument, but it doesn’t answer several key questions– namely that the expansion/devaluation process is precisely the “paradigm” for capital accumulation. Which means that if that reducing the value of knives does increase the purchase of the knives– then demand is NOT exclusively determined by use value, but demand is itself plastic, and derivative of the very accumulation process itself. For example, what’s the demand for Ipads in Bolivia as opposed to France or Canada? Use-value? But what determines how useful and Ipad is in France as opposed to Bolivia– the depth and breadth of the capitalist market– that is where human beings don’t participate as isolated elements, but as social beings; not as consumers but as class, and classes, that are obligated to exchange their labor power for the equivalent value of the means of production necessary to sustain that labor power. In short “demand” is driven by the process of reproduction, and is not static, determined, or simply a result of some “natural need” called use value. Wow I thought my head hurt when I read Hegel but trying to follow that knives argument took it to a knew level. Thx sartesian for explaining it in simple language. So demand and supply aren’t autonomous fancy that?